Eat yourself energetic with this informative guide to eating right and boosting your energy levels. Do you drag yourself out of bed in the morning, yawn through the working day, then collapse in front of the TV in the evening? We all feel exhausted from time to time but when that feeling continues, it's time to do something about it. There are excellent ways of eating yourself to energy which also boost overall health. Avoid being tempted by quick-fix caffeine or sugary 'energy' drinks and bars, focus instead on foods that keep blood sugar levels steady. By addressing the underlying causes of low energy, you will achieve lasting results. The Eat Yourself to Energy diet contains all the vitamins, minerals and trace elements you need to ease niggling health problems and make you feel tip-top and raring to go. 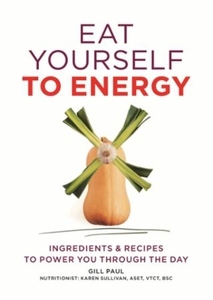 Featured in this book are the key foods that have been proven to increase stamina and boost energy. A clever problem-solver helps you choose the ingredients that adress your own individual symptoms, and the results are immediate. With over 60 easy-to-follow, quick-to-prepare, completely delicious recipes, and weekly meal planners, Eat Yourself to Energy is the perfect way to turbo-charge your mood and achieve optimum health. Eat Yourself to Energy includes... Part I Happy Superfoods Superfoods What's your problem? Putting it all together Part II Energy Recipes Breakfast Snacks Lunch Dinner Desserts ...And much much more!